Win Ko Ko couldn't believe it when his doctor told him he had tonsil cancer, and that the main cause was betel quid — a popular, and potent, alternative to chewing tobacco. "I saw myself as already dead," he said. He started making preparations for his death with his family. Ko Ko, 33, suffered from swollen tonsils and was bleeding from his mouth for two years before he finally went to hospital, where he was diagnosed with stage two tonsil cancer in July 2017. But Ko Ko, who made a full recovery, is among the lucky few. Most patients, if they are ever diagnosed, put off treatment until it is too late. One hit gives users as much energy as six cups of coffee. It's also highly addictive, and a cause of some of the most vicious forms of cancer ravaging the country. 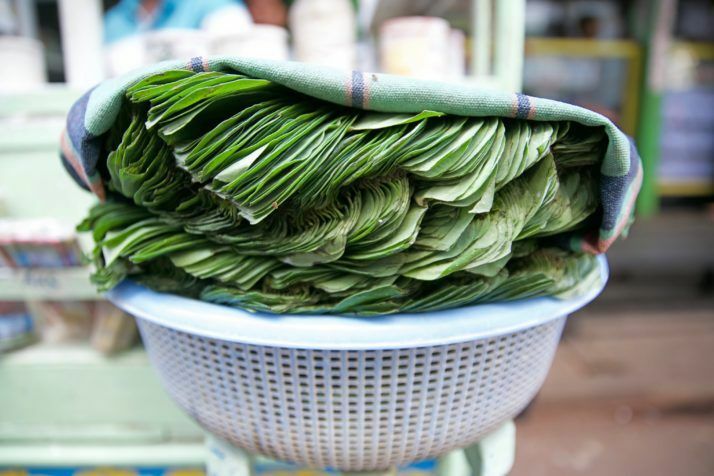 Myanmar's struggle with cancers caused by betel quid is an illustration of how even in the poorest countries the biggest obstacles to treatment and care aren't necessarily just financial. Because betel chewing is deeply ingrained in Burmese culture, many are reluctant to give up the habit or even to believe it is responsible for causing cancer. Some resist visiting doctors and prefer to rely on healers or more traditional methods, while taboos about leaving the house with ulcers or other visible signs of disease mean they may choose to stay hidden from view out of shame. Geographical access is also a complicating factor: With treatment centers few and far between, and transportation either unreliable, too costly or difficult, some patients cannot make the trip. Traveling to the capital to receive care, for example, involves paying for travel and hotel stays. In Yangon, the former Burmese capital, thick red spittle cakes the sidewalks, and garbage cans ooze with the leftovers of chewed betel. 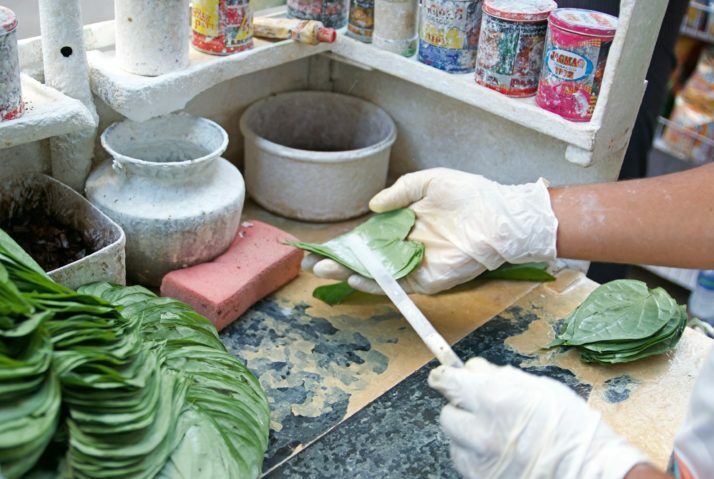 Every shop has its own recipe for betel quid, but the basic ingredients are always the same: a type of palm nut known as areca, tobacco, caustic lime and spices such as cardamom, cloves and cumin. 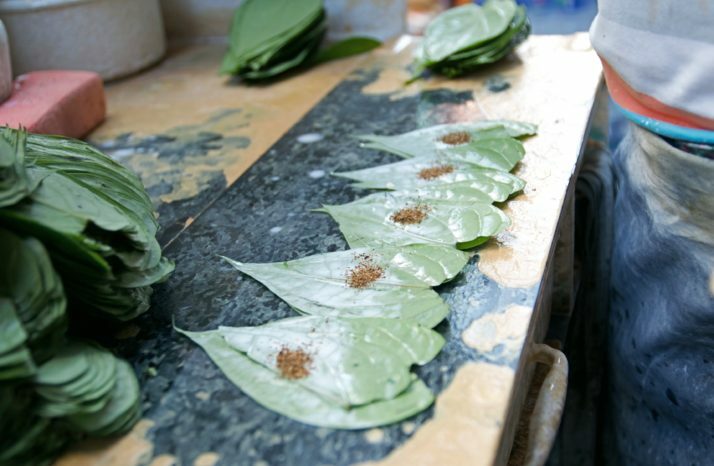 Sellers roll the mixture into green betel leaves, which are held together by toothpicks and sold in small plastic bags. The tannins in the areca nut cause the chewers' mouths and teeth to be stained red. One hit gives users as much energy as six cups of coffee. It's also highly addictive, and a cause of some of the most vicious forms of cancer ravaging the country. According to statistics from the World Health Organization, hospitals reported 69,554 new cases of cancer in Myanmar in 2018. Among men, esophagus cancer represents 8 percent of new cases, while lip and oral cavity cancers make up 4.9 percent. Doctors say betel chewing contributes to both types of cancer. But despite the connection, doctors find it hard to convince patients to kick the habit. For many, it is a deeply rooted tradition and part of daily life. "Betel chewing is part of the culture in Myanmar but it only started 400 or 500 years ago," said Dr. Than Sein, president of the People's Health Foundation, a nongovernmental organization pushing to improve public health in Myanmar. "Now people wear different hairstyles and clothes than before. So if we are able to disregard those traditions, why don't we disregard betel chewing, which kills people?" In Myanmar, cancer patients have access to four treatment centers — in Yangon, Mandalay, Taunggyi and Naypyidaw — for a population of 53 million. According to the People's Health Foundation, most people living in rural areas never seek treatment and ultimately succumb to their illness. Cancer survivor Ko Ko, a former sports journalist, began chewing betel 10 years ago to stay awake. His irregular schedule saw him working from around noon until 4 a.m. as he was responsible for covering football matches, which routinely run late into the evening. "I worked late nights so to keep me awake and alert, I would chew betel the whole night and drink and smoke until 4 a.m.," he said. "I lived a very irregular lifestyle." He eventually changed jobs and started working at a sports magazine with a more regular routine. 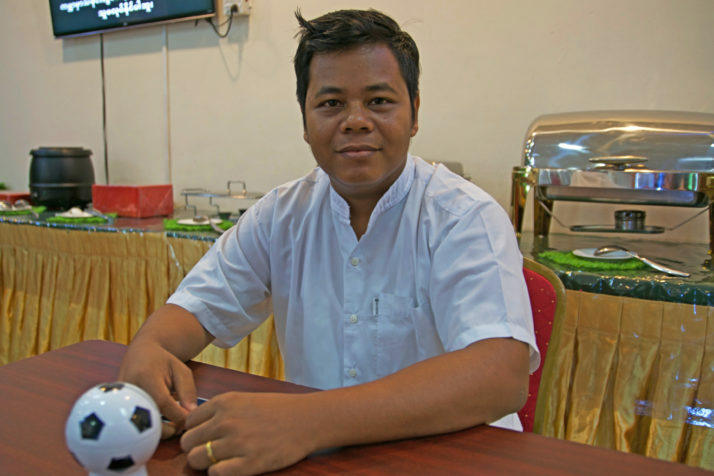 He is now the media officer for the Myanmar Football Federation. He had no idea, at the time, that years of betel chewing would take such a large toll. 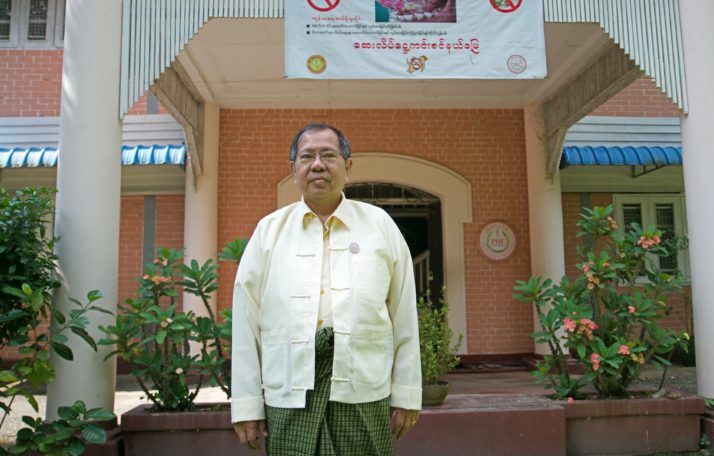 After several rounds of chemotherapy and radiotherapy at Yangon General Hospital, he was declared cancer free in April 2018. "I had both chemotherapy and radiotherapy at the same time," he recalled. "The medicine was so strong that I lost my hair. I also lost 25 pounds (11.3 kilograms). My number of white blood cells dropped. It is the worst situation I have ever faced, but now that I have recovered, I feel stronger mentally than before." He spent 1.5 million kyat (€861) on treatment, which is partially subsidized by the government, and a further 5.5 million kyat (€3,158) to cover other costs, such as food, hotel stays and transportation. According to the World Bank, the country's average annual income stood at $1,190 in 2017. Despite his brush with death, Ko Ko remains adamant that everyone should be free to make their own choice whether to give up their betel chewing habit. He, however, has completely quit. "I don't chew anymore. I quit," he laughed. "I am afraid to die." The headquarters of the People's Health Foundation, located inside a quiet gated compound, feels far removed from the busy streets of Yangon. Led by Dr. Sein, its president, the organization is working to ensure every Burmese citizen knows the risks posed by chewing betel quid. "People do not really believe that betel chewing causes cancer," Sein explained. "They don't really see cancer patients, so they don't see the link. Many people [with cancer] are afraid of going out of their house because you can see the lesions." The organization wants to change that, he said, and is working with the government to raise awareness about types of cancer associated with betel chewing. In 2017, it launched Stop Betel Myanmar, the country's first national health media campaign. It used the testimonials of two patients diagnosed with oral cancer — a strategy modeled off similar campaigns in neighboring India and Thailand. Sarah Mon, who helped organize the campaign, said the decision to publish images that showed the patients' ulcers was a highly controversial decision in the conservative country. The ads ran on television, radio and social media. The same campaign ran again in 2018. All six patients involved in the two campaigns have since died. "Burmese people are very shy. Everything is taboo here," said Mon, a media manager for the Stop Betel Myanmar campaign. "We filmed it, but we even had a hard time to get it past censorship even with the patients' consent. The government was afraid to show it, so it took us a couple of years to get off the ground." Part of the campaign also includes encouraging cancer patients to seek help from oncologists in government hospitals instead of turning to traditional medicine to treat mouth ulcers and lesions. "Patients are afraid of getting help from the hospital so they go to traditional healers," said cancer specialist Sein, adding that most people die within "six months." The campaigners' efforts to change tradition is likely to take more time and effort than they'd hope. When Hla Oo, a retired taxi driver, was diagnosed with nine kidney stones, his physician asked him to stop chewing betel. "I just laughed," 63-year-old Oo said. A life-long betel aficionado, Oo has been chewing betel quid for 50 years. It's a habit he picked up from family members, none of whom have cancer, he said. He doesn't believe the betel could make him ill.
"We are all mortal," he said. "We all die somehow."